Hi everyone, I’m US Candidate Master Daniel Johnston and this post is about coming from behind in lost positions. First let me say that I’ve been following Chess^Summit with interest since my coach, GM Eugene Perelshteyn, told me about it (Eugene is also Isaac’s coach! ), so I’m happy to be a guest here today. We all know the reason why chess is such an unforgiving game: If you make a mistake, it can give your opponent such a big advantage that coming back can be close to impossible. Through tournament practice, however, I’ve learned that seemingly sure defeats can turn into draws and wins, even against strong and highly experienced opposition! A lot of times players may not be aware of how possible it really is to come back from an objectively hopeless or nearly hopeless position. In the past when I would get a bad position against a strong opponent I would view it as torture. Not anymore, however, now that I know any position can turn into a win. Yes, I (yellow shirt), did come from behind to draw this game! So what strategies will enable you to escape defeat? Here are some I’ve noticed that seem to work well and increase your chances of pulling off a comeback 🙂 Also check out IM Alex Katz’s article specifically about swindles. First, you have to be aware that regardless of rating or title, any player can blunder. Let me show you an example from last year’s World Open, when I was playing against IM Timothy Taylor. This game made me start to understand that any player can make big mistakes at any time. At the time of the game, I couldn’t believe what had just happened. I was elated to have beaten an IM, obviously, but didn’t think winning after a series of poor moves from my opponent was that impressive. True, it may not be. But this kind of thing happens far more often at a far higher level than many people may realize. While I was shocked then that an IM had played this way, now I think it would only give me a mild surprise. The first mistake in this game, taking on g7, should actually not be that big of a surprise. Imagine the thought process, “Ok, now I’m going to take on g7, removing a defender, and then check on d4, making him weaken his kingside.” Missing that this actually helps black can easily happen. And it’s true that even there, white has a serious advantage. Many strong players would go for that just like my opponent did. Note on the flip side that as the player that has the advantage it’s important to be careful and make sure that the line you’re choosing puts the maximum amount of pressure on your opponent. The other mistakes in this game are more difficult to understand, and usually wouldn’t happen from a titled player. However, anyone can have a bad day and taking advantage of these situations is very important. I’ve seen many players blow wins or draws against higher rated opposition by being too cautious or trusting their opponent too much. Higher rated players already have a skill advantage, and giving them this further psychological advantage can be deadly. Instead, it’s important to be objective about both you and your opponent’s skills, but you should also realize that you have a fighting chance against anyone and shouldn’t be intimidated. This often comes simply by getting practice against strong players, like I got in this game. While it’s important to take advantage of the kind of mistakes that we saw in this game, the truth is that higher rated players blunder a lot less frequently than lower rated players. Counting on them to simply make an outright blunder is typically not going to be a very fruitful strategy (but you also must be aware that them blundering is always a possibility). One useful thing to keep in mind, however, is that if even FIDE titled players make these kinds of mistakes, what about national masters and experts? The truth is that there are often tons of mistakes from both sides in my games against these players, and bad positions turn around quite often, so you shouldn’t lose heart against them unless your position is truly disastrous! While higher rated players may not blunder much, they are still very susceptible to making mistakes (like Bxg7 in the above game). In order to increase the possibility of any opponent making a mistake, you need to try and put as much pressure on them as possible when you are in a bad position. Imagine that you’re in a complete positional bind against a strong player. If you simply wait and do nothing, the game is most likely already over. Your experienced opponent will probably easily exploit their advantage. To get yourself back into the game, therefore, it’s imperative to create dynamic counterplay. If you’re unaware, chess can be divided into statics and dynamics. Statics are long-term things that aren’t going to change easily, like pawn structure or material. Dynamics, on the other hand, are short term aspects of a position, such as king safety or piece activity (although activity could also be considered a static advantage if you have, for example, an outpost or two bishops). If your opponent has a static advantage, you have to counter by creating dynamic counterplay. This isn’t just true when you’re massively behind; it’s true in every situation. After all, if your opponent has a long term edge and there’s nothing you can do about it, your only choice is to try to utilize short term advantages to try and change the nature of the position. Changing the nature of the position is almost always favorable when you’re behind. In a dynamic position, your opponent at the very least has to shut down your counterplay. And nobody likes being under pressure. If you’re getting squeezed to death, the odds of your opponent making a mistake and letting you back into the game may be slim. But if you give him problems to solve, even if it’s objectively still good for him, you’re giving yourself a chance. Here’s a game I played at this year’s World Open against FM Dov Gorman, where he executed this to great success against me. So did my opponent make the right decision by sacrificing a piece? Despite my loss, and the shots he could’ve played with Rxf2, I’m inclined to think not in this case. After all, had I managed to keep my head better and calculated more accurately, I would’ve been on my way to victory. Maybe my opponent could’ve looked for some other kind of counterplay later. It’s crucial to not just complicate hastily, but in a way that can be supported by the position as much as possible. I think the line here is something you learn as you become a better chess player. Either way, this is a good example of the kind of dynamic counterplay and pressure I’m talking about. When faced with only a small positional deficit, my opponent went all in to change the nature of the position! You should be searching for such opportunities if you’re statically behind. Exactly what kind of dynamic position do you want? I think a good general strategy is to force your opponent to do concrete calculations. This is what Dov Gorman successfully did against me. While some players may of course be very good at calculation, this is an area where anyone can make a mistake, and where a mistake can be game-altering. Calculation is simply an additional avenue to outplay your opponent, thus giving you more chances, which is true even if your opponent is better at calculation than you are. Players are also often especially hesitant to go for things that look messy when they have a big advantage. A calculation error in a complex position can easily change the evaluation dramatically. So while any kind of dynamic position is good when you’re at a disadvantage, I think the best is one where your opponent is forced to do serious calculation. Note however that this may backfire if your opponent is a skilled calculator, so as I said before, try and create complications in the way most supported by the position. Also, keeping your head after you make a mistake and continuing to play as usual is one of the best things you can do. Those of you who play bullet will know that a lost position is hardly something to panic over, especially if you’re up on time. After all, anything can happen. While classical chess is of course not so wild, anything can still happen, and the way bullet players continue to fight on unconcerned by deficits is a good example of the kind of attitude to take during long games. Actually, a lot of the time, your position may not even be as bad as you think. Here’s an example of a game I played against a strong 2100 where I blundered a pawn on the seventh move but won anyway. As you saw from the game, I got a lot of play for the pawn, even though I lost it completely by accident. Ok, so I got lucky there that my position was not actually so bad. But I did the right thing by staying calm. Instead of letting a mistake or bad position get you down, you should focus on using the resources you do have in the position. After all, your opponent is not a computer so it’s more than likely you’ll have some chances. Also, I was able to play quickly and put my opponent in serious time pressure, which always increases your chances greatly. To sum up, coming back from a bad or lost position largely comes down to being aware any opponent can make a mistake, changing the nature of the position by creating dynamic counterplay (if you can force your opponent to calculate, that’s even better), and staying calm and focusing on using the resources in your position. Executing this in games, of course, is far less simple than it sounds. It is largely based on your skill as a player to recognize chances and correctly decide what kind of counterplay you should go for in a given position. Also, I should note that all of the above becomes more and more effective as the tournament progresses to the later rounds! Here’s an example of a mistake-laden game I had in the last round of the 2015 World Open against NM Sahil Sinha, of Chess Rival ^ Summit fame. Sahil’s claim of beating Chess^Summit writers is at least true in my case, as he’s won the other two games we’ve played. Everything we said about complicating the position and forcing your opponent to calculate proved true in this game. Even though I played quite poorly, by latching onto the counterplay I did have I was able to survive a completely lost position. I think chances are good, however, that Sahil would’ve won this game had it been played in the early rounds of the tournament. Of course, any tournament player will be aware of the proliferation of mistakes in the concluding rounds of the tournament. That means you should dedicate even more of your energy to searching for counter chances towards the end of a tournament, because they are much more likely to be there. I think coming back from a bad position is almost an art form in itself. So if you find yourself in trouble, try not to be disheartened. This is simply a natural part of the game of chess, and as good an opportunity as any to do your best and show off your skill! Of course, your opponent may play great and rebuff all your attempts at counterplay. Or you may have truly messed up your position beyond any repair. Then it all went downhill. Two disastrous back-to-back tournaments in August cost me a huge amount of rating, not to mention confidence, and put me back on the other side of the hump I had just crossed. I played two tournaments in September. The first was fairly good, the second was fairly bad. And then it happened. I scored a GM norm. Yes, GM as in “great mystery”. I have no idea how I got a 2603.7 FIDE performance and tied for first at the Washington Chess Congress (October 5th-10th), but I’d like to walk you through it, and maybe we’ll find the magic potion. There I was, going to play a 9-rounder. The highest realistic goal I had was to get my second IM Norm, but let’s face it, I was just trying to get a good solid result to reverse the downward trend. I started the tournament barely in the top half. I got white in the first round against a significantly lower rated player. There were some tactical mishaps, but I prevailed. In round 2, I got black against IM Prasanna Rao (2466 FIDE) from India. I thought that a draw would be a good result. It was a rock solid affair. He didn’t get any real advantage from the opening, and I never let him get anything real going. We agreed to a draw in an equal position after move 40. So far so good. In round 3, I got to play against Wesley Wang (2076 FIDE, 2239 USCF), down for the last time in the tournament. I played him before with reversed colors and we drew. This time I had white, and I was looking to win. That was a disappointment. I had white against a lower rated player, got a winning position after 19 moves, and couldn’t finish him off. At least I didn’t lose though. The next round was the next day at 7 pm. The pairings were up in the morning, and I found out I was black against the 2nd seed, GM Denis Kadric (2594 FIDE). So what to do in that situation? Just walk away! I don’t know about you, but I went to see that National Archives (sorry, pictures weren’t allowed inside). The weak American colonies being victorious over the powerful British Empire must have worked as subconscious motivation! After I got back, I prepared for a while. Kadric does not always play theory and even opened some games with 1.d3. I’m not joking, he did it against some GMs. However, I didn’t expect he’d play something that offbeat on move 1. All I have to say is that my prep ended on move 2! Spoiler: This was a repeating theme throughout the tournament. That was a boost! It was strange that I beat someone 500 FIDE points higher with black than I had drawn in the previous round, but I took it. Things were looking good. In round 5, I got to play another GM, Danny Raznikov (2531 FIDE) as white. A draw would not be a bad result, right? Well, I was really surprised how nicely the game developed. It was a Najdorf that went wrong for him, and I got a powerful bind. Whoa, how did that happen? I was actually tied for first with 4/5. IM Norm time? The next round brought me back down to Earth. I got black against GM Julio Sadorra (2573 FIDE). I made some inaccuracies past move 15 which turned out to be pretty serious. I got a position which on the surface seemed slightly worse but holdable, but in reality it was terrible for me. White just had a huge advantage which he converted into a full point. Okay, that was an awful game from me, but the tournament was still going fantastic. I started looking into the numbers. It turned out I had had a GM Norm performance going into the previous round! Anyway, if I played strong enough opponents, as it happened, 1 out of 3 would be enough for an IM Norm. The next round, they gave me a double black against Praveen Balakrishnan (2458 FIDE). This was NOT the first time we played. I lost three games to him a long time ago, and then we played three times this summer. I won the first one with a lot of luck; I was clearly worse practically the entire game with white and was probably lost when he messed up. This was followed by two losses with black in the same line in the French. Okay, I had some improvements there, black should be fine… but I had lost two games there, I needed a change of scenery. A solid draw would be a reasonable result, right? Well, the game was far from solid, and it was not a draw. That was a fun game. Now, there were 2 rounds to go, and it was time to crunch the numbers. The bottom line was that 0/2 would be enough for an IM Norm if I played an average of 2456 FIDE or higher, which was likely but not guaranteed. A draw would basically secure an IM Norm. Then, there was the seemingly hypothetical shot for a GM Norm. I’d need 1.5 or 2/2, most likely against two GMs, to get it. Before round eight, the pairings at the top were a mess. When the dust settled, I was white against GM David Berczes (2478 FIDE). We played once before in the Philadelphia Open this year with reversed colors, and he beat me fairly convincingly. Going into the game, I didn’t know if I should play for a draw to secure an IM Norm or for a win to try to get a GM Norm. I decided to let the game progress naturally and see which result to play for. Luck, luck, luck. I guess that’s a mandatory part of every norm. My IM Norm was firmly secured! It soon became fairly clear what would happen with the pairings. I was tied for first with GM Gil Poliski and IM Ruifeng Li. Because Popilski and Ruifeng already played, I’d get to play Popilski as white. Yes, I would be playing on board 1 in the last round of a major tournament. A draw would be enough for a GM Norm. No stopping when I was so close. Another factor to take into account was that Ruifeng needed a draw for his final GM Norm. It was unlikely he’d press hard for a win. I thought Popilski would likely play for a win to try and get clear first. I played a fairly harmless but solid line against his Scandinavian. I drifted into a position which was probably a tiny bit worse for me, but nothing convincing for him. I managed to restore the balance, and he offered a draw in a position which was equal, without too much for either side to do. I accepted immediately! And so I got my GM Norm and tied for first. Ruifeng also drew and became the current youngest American GM. Huge congratulations. GMs Stukopin and Sadorra both won to join the tie for first. Praveen Balakrishnan, whom I played in round 7, won his last two games and managed to get his last IM Norm, so big congratulations to him too. Get white against a significantly lower rated player in round 1, and win a low-quality game. Draw round 2 as black against an IM (suffering is allowed). Blow a winning position in round 3 as white and draw it. Beat a foreign IM/GM with black in round 4. Win against the same opponent, preferably someone you have a pathetic score against, in round 7. Lose to all Filipino GMs you play. Have at least 3 games where you prepare for something extensively, and your opponent doesn’t play it. In at least one of those games your prep should end on move 2 (or earlier #1.g4). Your prep ending on move 3 in another game is also a good sign. Is it good or bad that conventional aesthetics don’t matter so much in chess? Realizing early on that a win is a win saved me from most of the temptations of judging moves or positions by appearance (though I’m not immune to the old “not admitting mistakes” pitfall). It helps that playing the Caro-Kann doesn’t usually leave me a lot of choice in the matter. This post isn’t about opening preparation (still my weakest area by far! ), but recognizing that there wasn’t a truly clean (i.e. attractive and consistent) way to counter a particular opening idea was crucial in a recent game of mine. IM Jeremy Silman has written a great counterattacking article using a similar line as an example. Sairam, a recently-crowned expert, is beginning to see the ups and downs of life in the 2000s, after some recent successes. In one of them, I reacted badly to an idea that, at first, might look too primitive to be good. and Black has failed to provide any real challenge to White’s queenside conquest. If you’ve seen similar (good or bad) ideas for White, …e5 seems like something Black is most likely to strive for. Unfortunately, this is easier said than done, as I found out the hard way in that game. In a rematch with Sairam two months later, I was more prepared. I changed up my anti-Panov repertoire in time, but Sairam found a way into familiar territory. Incidentally, it was a direct transposition to the position in our previous game after move 10. My book’s flashier recommendation of 6…g6 7. Nb5 e5! was a little too much for me at the time. Aside from trying for an …e5 break (in our last meeting, my 9…Nd7? came nowhere close), this is the main counterattacking idea. Obviously, White can’t take on e4, and doesn’t want to end his queenside ambitions with bxc3. There are a number of directions (which I won’t go into) for both sides here, so the rest of Black’s strategy is not clear-cut yet. 10. Rc1 Qa5 11. Qa4 Qxa4 12. Nxa4?! I sympathize with White here, because 12. Bxa4 already didn’t offer much; after something like 12…Nxc3 13. Rxc3 and a future b2-b4 push, …a5 will be more effective than before due to the disconnection of White’s rooks. However, the game move certainly leaves White in some uncomfortable contortions. It was here that I realized White’s dark-squared bishop didn’t have a particularly good retreat. For example, after 13. Be3, Black can not only play for my original idea of …f6 and …e5, but also …f5, …Bf6, etc. after which the d4 and c5 “chain” really sticks out. White chose a more direct way out (in part due to the insertion of Bxc6/…bxc6 which introduced the additional threat of …Ba6), but it didn’t seem like a happy choice. I was a little surprised at the time, but in hindsight risking 16. Rxc6? in the face of Black’s two bishops (and the …Ba6 idea) was likely worse. And after the game move, it wasn’t trivial to decide how to defend the c6 and g5 pawns, given that Nc5 and possibly Ne5 were coming. I showed someone what I did, and he was amazed I wanted to go into something so ugly; however, once you’re up a pawn, it really only matters that you’re able to eventually convert. The “badness” of Black’s bishop is irrelevant here, and despite their initial appearances, Black’s c6, e6, and f6 pawns are not weak. At worst, Black can march his king to d6 and unleash …Be8-g6, with temporary defense by the rooks as necessary. While Black’s bishop may be bad for the moment, White’s knight is definitely not useful enough to produce critical counterplay. 26…Rc4!! would have been a nice find here, ending the game pretty much immediately after, for example, 27. bxc4 Rxb1+ 28. Kh2 Rc1. 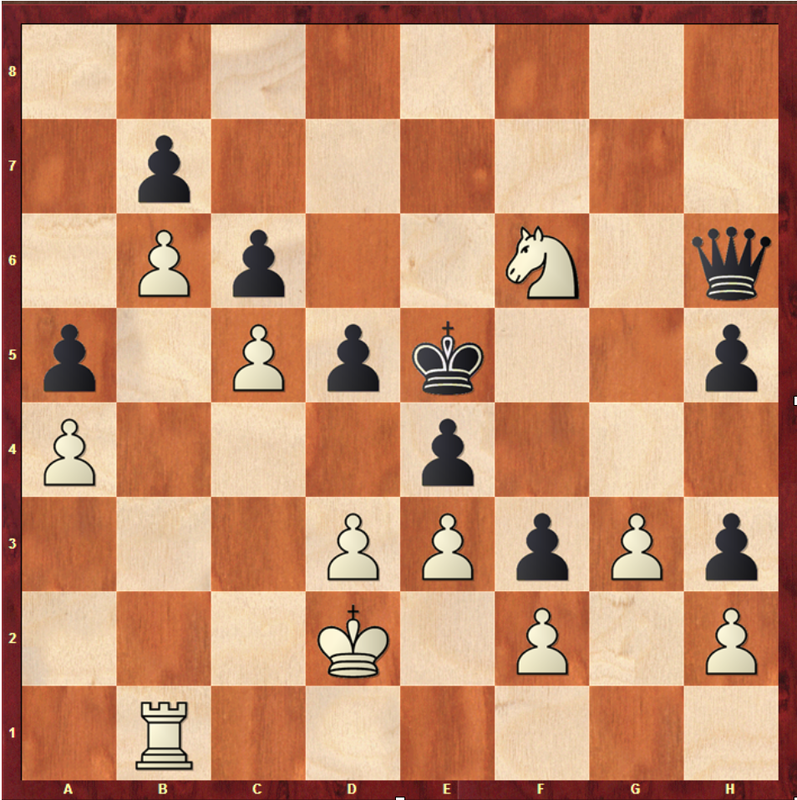 Nevertheless, 26…Rxa4 was still more than enough, especially with White’s time pressure. 27. Re1 Ra2 28. Rxe6 Kf7 29. Re2 Bd7 30. Rce3? Bf5. Again, aesthetics didn’t matter here, as Black has completely busted through the queenside. From here, it was mostly smooth sailing, but I feel obligated to record a moment of gross negligence later in the game. While 50…a2?! 51. Rxa2 doesn’t blow the game, 51…Rc4+?? does (51…Rc8 followed by …Rd8 still wins easily) due to White’s counterplay based off the advanced h6-pawn. Of course, White was still in time trouble, which allowed me a somewhat (at this point) undeserved win. Otherwise, I played this game pretty well, and although it wasn’t the most aesthetically pleasing to play, a lot can definitely be learned from it. After a great turnaround from a disappointing end to the summer, I’m looking forward to the opportunity to bring back some great news from next weekend’s Pennsylvania State Championship, which will feature… three of us (Isaac, Grant, and myself)! Stay tuned for a few fun posts about that! Best. Weekend. Of. My. Life. There is honestly no other way to introduce my first Millionaire Chess experience. I am not saying that it was my best performance ever nor my best tournament ever. I am saying that out of all the weekends I have ever had, whether it was full of chess or not, this was by far the best. I had no expectations going in except that it would be a cool tournament to meet some famous grandmasters. With a new Olympic gold medal under his belt, I have to admit I was most excited to meet Sam Shankland and have him sign my chessboard. Equally exciting were my prospects of meeting Jeffery Xiong and Varuzhan Akobian. I was also excited to see friends and make new ones. When I arrived at Harrah’s Resort in Atlantic City on Thursday night, I felt a little nervous. I hadn’t done as much opening prep as I wanted to do. My coach was encouraging but I worried what I had spent all this time studying was never going to be enough. I didn’t think it would help, however, to cram any of it that night. Instead, I went to see friends and was happy to reconnect with them. I suppose I was right to be nervous as my first game was an absolute nightmare. I do not recall another game I ever played where I felt as paralyzed as I did in that one. It was frustrating to experience that in my first round of the tournament. My attitude turned sour and I was not feeling positive as I went into my next game, which was better, but still ended in a loss. With two games left, I could not afford to feel discouraged, though. I was facing a lower rated opponent which meant I needed to win. Fueled by necessity, I went on to win the game. Then, I won the next, against someone who was higher rated than the two players I lost to. The night ended well, therefore, and my faith in myself was restored. The next day started just as disastrously. I could tell I was going to lose my game about halfway through, but I still fought for a draw. I began to count how many people had higher results than I had. I was vying for the U1200 prize in the U1600 section, so my overall tournament results actually did not matter so long as I made the top 5 under 1200 for some prize money in return. I counted four people with more points than I had, so at that point, I could only try for 5th place money: $600. I figured the money would be split for 5th place because there was no online mention of a playoff for the prize, and I was satisfied that I would be receiving some money. I returned to my room, content to be receiving some $200 (I counted a 3 way tie for 5th). Because a friend had made the open section’s Millionaire Monday playoff, I returned to the hall about half an hour after the scheduled playoff time to watch him. Imagine my surprise when I read a flyer on a board claiming the U1600 section had playoffs for the U1200 prize. My name was on the list! I scrambled to ask the first man I saw for the time and he just happened to be Maurice Ashley. I was half an hour late! I had missed the playoff! I hightailed it into the room where the playoff was occurring and was relieved to see that it had not yet begun. My heart was racing from my sprint into the room. I sat down at my seat and tried to make sense of my situation. Firstly, it was clear that I did not know how to count. There was a 4 way tie for the last place to qualify for Millionaire Monday. I had completely miscounted and would perhaps be eligible for the finals. Secondly, I knew I didn’t have much blitz practice. I heard so many quotes that blitz rots your brain and had limited my blitz play immensely throughout the years. I never liked the pressure of the quickness, either. Luckily, I had friends to support me. My nerves were at an all-time high as I realized I could qualify to play in Millionaire Monday for more money and some temporary fame. I don’t think I ever stopped smiling, though, except to calm myself down. With many hugs, a few handshakes, reassuring squeezes, and exclamations of good luck, I started my games. It was a double round robin, but one of the players failed to show up. I played two girls, twice each, and emerged the winner by some miracle. Only one game made it to Chess24’s broadcast. That meant I needed to brace myself for the more intense games that awaited. I had dinner with my friends and was happy to learn that two of them had made it to their respective matches for the following day. After small celebrations, we retired to our rooms to prepare for the real battle: Millionaire Monday. The next morning, I felt tired but excited. I can clearly remember trying to soak in all the prestige of the playing hall. “You made it here to the Hall of Champions,” Maurice said in a speech before we started our games. No, we were playing in the U.S. or World Chess Championship. We wouldn’t be glorified for this our whole lives. But we were already champions in our own right and on our own scale. In that moment before we started our games, I felt pride and accomplishment I had never experienced so overwhelmingly before. Of course, we still had games to play. Mine were all blurred together. I won every game as white and lost every game as black. I do not feel the need to go into explaining them, but you can see the games on Chess24. I’m not particularly proud of them as they were born in desperation and the quick ticking down of a clock. I was living on adrenaline, as anyone would in this situation. Regardless, I fought with an opponent back and forth for hours, eventually playing the only Armageddon of the tournament. It was my first ever Armageddon game, which I lost. This landed me third place, as one man in the section failed to show up. I was disappointed but at the same time grounded by the fact that I never thought I would even make it to Millionaire Monday. Later, I honestly felt I was celebrating not only my third place, but I was overwhelmingly happy for the sake of my friends, GMs Dariusz Swiercz and Cristian Chirila, who won the Open Section and the Under 2550 prize within the Open. Feeling happy for my friends’ successes made the celebration meal all the more exciting, as my company included people who were in good moods. From this celebratory dinner, I learned something else that was valuable to the tournament experience: the sense of community through chess. Everyone celebrated in their own way. Every chess player, I feel, understands what it is like to fit in, to find a place in the chess world. I had never felt I had such a good group of friends, or at least company, at a tournament as I did at Millionaire. I feel that no tournaments henceforth will ever as enjoyable because the company would not be quite the same. In this group, I felt a comfortable belonging, maybe bordering on a small family. Despite all the positives, I had a lot of personal issues that arose from the tournament. Going into the event, I had many hopes that somewhat became failures by the end. I had pushed myself to be playing better chess. Even though I was constantly paired with people rated more than 200 points higher than I was, I felt I had studied enough to hold against them. At the end of the initial seven rounds, I felt quite disappointed in my 2/7 score, even though I knew I was the 61st seed out of 65 in the U1600 section. It seemed like I was never going to improve and sometimes I still feel that way. This is probably the attitude and discouragement that turns many people away from chess. I didn’t expect to win. It was simply unrealistic. Despite this, I wanted to do better. After all, I had decided months ago that I would play in the tournament and had been training since. Sometimes the little improvements aren’t that obvious, though. A grandmaster friend once told me chess isn’t about results. I feel that when my coach tells me my games have been much better. I feel that when I play a good game and lose, but I know I can learn a lot from it. I think it takes great courage to overcome a bad result. It takes courage to keep going. I think you have to understand that it will never be easy, but you push through anyway. Additionally, as long as chess remains fun, it will be worth it. Tournaments like Millionaire teach us the importance of having fun in the midst of pressure. It was exciting, it was intense, and it was everything I could have hoped for. It was the culmination of every little bit of happiness and excitement of the roller coaster ride that was Millionaire Chess 3 that made it so successful. I doubt I will ever have a tournament experience quite like Millionaire Chess again. I’m extremely dismayed that this past tournament was perhaps the last Millionaire. I hope one day it may be able to make a comeback, that it will find support like never before, but no matter what, I will always remember my experience there fondly. With the winner of the Open Section! To close, I would like to congratulate all the winners, especially Dariusz Swiercz. I would also like to thank the people vital to this amazing weekend. Amy Lee and Maurice Ashley get the bulk of my thanks for organizing the best tournament of my life. They are truly inspiring and I admire their efforts to hold such an event. My coach, Isaac, deserves so much thanks for his support before, during, and after the tournament. I could not have done anything without him. My sincerest thanks to Alejandro Ramirez, Alice Dong, Sophie Morris-Suzuki, Dariusz Swiercz, Yaro Zherebukh, and Cristian Chirila for being the best tournament company I could ever hope for. Many thanks to Arthur and Joel for your dedication to cheering me on, and to Alex Wiener, Greg Shahade, and Fabi who gave me so much love online. Lastly, I owe many thanks to David Llada for taking the time to photograph so many amazing pictures of me, despite the obligation to take pictures for the overall tournament. The U.S. Chess School, founded by IM Greg Shahade returned to the beautiful city of San Francisco during the last week of July 2016 to hold their famous Chess Camp. This camp was made possible through the generous sponsors of Dr. Jim Roberts, the Scheinberg family, John Donaldson and the Mechanics Institute. Two years ago, I was invited to the 24th US Chess School Camp. At that time, I was the second lowest rated chess player to attend. The rating range of USCF 2100 to 2400 may have been challenging to deal with, but both of our instructors, IM Greg Shahade and IM John Bartholomew found a way to make everyone benefit from their lessons. I never had a coach, never took a lesson, so this was a new experience for me. I did not know what to expect, yet the chess camp in 2014 was the best, and most gratifying chess experience I had in my short chess career, and I couldn’t wait to go back. Over the summer this year, the 35th US Chess School occupied the famous San Francisco Mechanic’s Institute, the oldest running chess club in the U.S. I had been invited again and I was looking forward to another great chess camp. The camp’s full schedule started at 10:00am and ended at 6:00pm that last 4 days. Each day consisted small breaks and an hour long lunch break. The chess camp consisted of 11 strong players from California, and one strong WFM from Texas. The 12 attendees were: FM Rayan Taghizadeh (2336), (almost FM) Josiah Stearman (2315), NM Siddharth Banik (2309), NM Ladia Jirasek (2305), WIM Agata Bykovtsev (2297), WIM Annie Wang (2251), NM Alex Costello (2247), WFM Emily Nguyen (2241) from Texas, Balaji Daggupati (2108), Cristopher Yoo (2089), Seaver Dahlgren (2079), and Karthik Padmanabhan (2035). Our coach was the well-known International Master Greg Shahade, founder and president of the U.S. Chess School, founder of the New York Masters and the U.S. Chess League, and who is also a pretty good poker player. This year Greg had no help but was ready to go 1 against 12 and leave no chess stone unturned. It was time to learn. The first day started with a quick introduction and a nice endgame study. It was early in the morning and this puzzle got our brains running. That was hard! After, we immediately jumped into our lessons. These lessons were not any ordinary lessons, but carefully crafted chess art, so each and every player could be challenged to come up with their own idea, formulate a plan, or have a chance to uncover a GM strategic move. Kudos to Greg for making these amazing lessons! We started by talking about the legendary Mark Dvoretsky, and going over the games of one of his students, Sergey Dolmatov. We looked at critical points in each game and analyzed not only the position, but the psychology behind each of Dolmatov’s decisions. That is something you don’t find in any regular chess lesson. After an intense, yet fun-filled 3 hours, we took a lunch break. Time to eat, time to rest, right? Not so fast. Put 12 chess players in one room together and your lunch break turns into a continuous chess competition. The best part of having our chess camp at Mechanic’s Institute was that it is filled with chess boards. Most of us quickly ate our food so we could go play bughouse. It may not help your chess, but it sure is fun! After lunch, Greg started to analyze our games. He found mistakes typical of younger players and constructed a lesson around it. Many younger, less experienced players want to attack and attack right away. In some games, that could be the difference between a win and a loss. Greg explained to us that sometimes we have to be patient and keep things under control before going on an all-out attack. If your opponent can’t do anything, just build up your position improve your pieces to their best potential, and only then start attacking. Then, we took a quick break to let the material sit in our brains. After, each of us participated in a simul against Greg. Since we were a “strong bunch” according to Greg, it was only fair that he be white in every game. Greg won most of the games, drew a few, and fell only to Alex Costello. Day 1 was a blast, it went by fast, and there were still three more days to go. Day 2 started very similarly to Day 1. 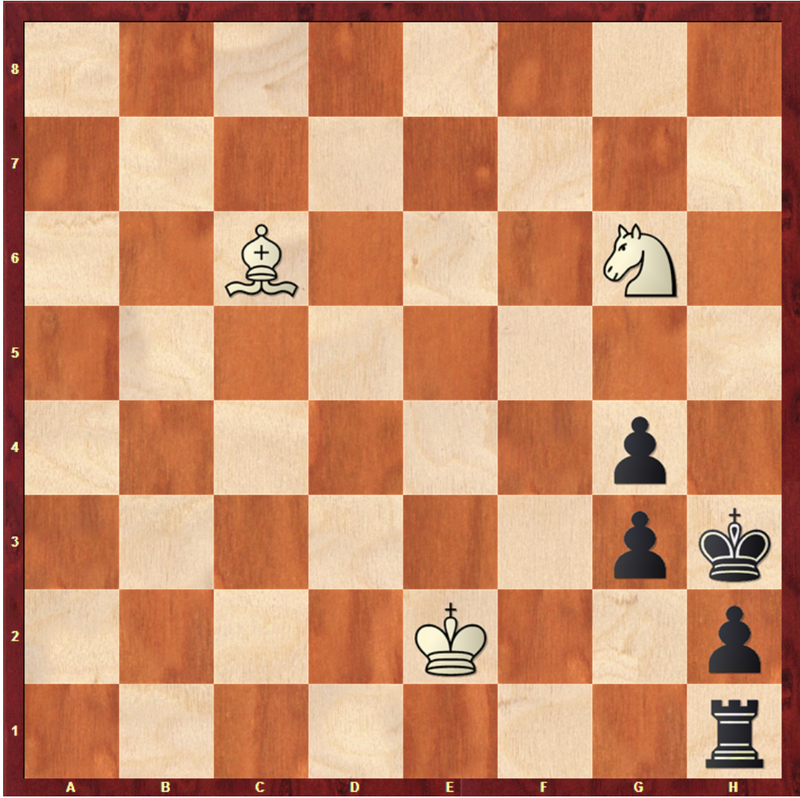 We started with another fascinating endgame study and then focused on the idea of prophylactic moves (stopping your opponent’s threats before they happen). Every serious chess player knows that there was nobody better at prophylactics than the great Anatoly Karpov. Any ambitious player can review the Karpov – Spassky 1974 Candidates game 9 and try to find Karpov’s prophylactic moves. The lesson was very instructive and Greg had no problem getting us all involved. Greg also analyzed our games and pointed out some of our mistakes and showed us how we could further improve our chess. Later, we had another lesson on prophylactics. When we were done, it was the time everyone was waiting for… the 1-0 (1 minute) bullet tournament! Pieces were flying all over the board, we were all having fun. In the final, FM Rayan Taghizadeh was able to beat the “bullet machine”, Josiah Stearman, in the final match to get first place. Day 2 ended with Rayan celebrating his victory as well as his birthday. Happy Birthday, Rayan! Day 3 began with another endgame study. This time, having two days of practice, Greg made the endgame puzzle much harder and more challenging, yet many people still figured it out. Halfway through the study, we ended up in this position. We felt that in those last two days, Greg stimulated our brains into a different chess zone. Ideas were coming out of the woodwork, the possibilities were endless and we felt good! After the endgame study, Greg came up with an engaging concept. We started a training game from a position of a GM game. We did not know who were the players or the correct ideas in the given position. We had 20 minutes to play and figure out the correct plans for the side we were playing. This is a great way to study and practice chess. When we finished the training game, we analyzed the actual game and found out what each player did. At the end of the day, we had our 3-2 (three minutes and two-second increment) blitz tournament. As with the Bullet tournament, Rayan emerged victorious again. This time he had to fight much harder for the win. In the final match, he was facing Josiah again. The game started out in the Italian opening, but in the middle game Rayan left his rook undefended. What was going on? Was it a trap? Did Rayan blunder? Everyone was wondering how a great blitz player could make a move like that and at the same time, how Josiah would miss an obvious attack on the rook. Both players were focused on other pieces and the rook remained unnoticed. The game ended as a draw so the players switched colors and began a 1-1 (one minute and one second increment) bullet game. This game was won by Rayan and his reward was a large bag of Ghirardelli chocolates. A very tasty motivation! Rayan Taghizadeh is the only person to have won both the Bullet and Blitz tournaments at the US Chess School. Congratulations Rayan! 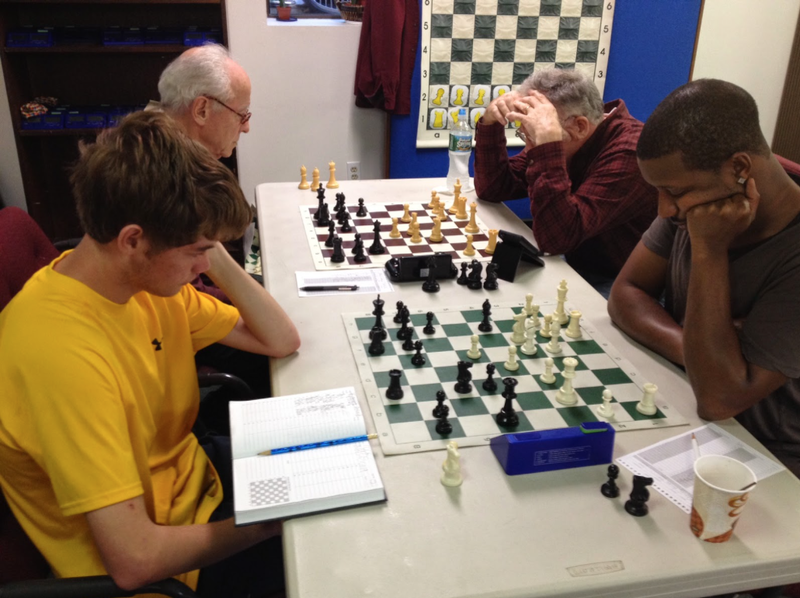 Our final day at the US Chess School was going to be different from the previous three. Except, we still started with another endgame study to get our brains running and then we finished analyzing our games. Afterwards, we played another training game. Just like yesterday, we did not know the players or the plans, but this time, we only had 15 minutes to play and figure out the correct plans for the side we were playing. After we finished, we analyzed the game so we could understand the correct concepts. Later on, we took a really interesting test: “The Intuition Test.” There were 30 puzzles of varying strengths and we only had 45 seconds to write down our intuition move (the first move you think of) before the next puzzle starts. Some of us found out that our intuition was great and mostly correct, but others learned that they needed to work on their first instinct move. Either way, it was a great learning experience. For our lunch break, we were invited to a mobile advertising company called Fyber. They provided lunch for us and then challenged us to games of chess and video games. Some of us played chess and others took turns playing Ping-Pong and Super Smash Bros. Brawl. Going to Fyber was a great way to end our time at the US Chess School. The people at Fyber were gracious and fun to be with. Thank you to Fyber for providing us with lunch and entertainment. All of the students won’t forget it! Thank you, Greg, for being an amazing coach and I hope to see you at the next US Chess School. Also, a huge thank you to our main sponsors Dr. Jim Roberts and the Scheinberg family. Thank you to John Donaldson and the Mechanic’s Institute for providing us with their space throughout the camp free of charge. It’s one of the bet chess clubs in the country, and they support us chess players year after year. As the US Chess School Camp was over, five of us went to the People’s tournament in Berkeley. I wanted to put my newfound knowledge to the test. During the games, I found out that many moves I was thinking of now were not moves I thought of before. I would always try to find out what my opponent’s long-term plan was and I tried to stop it (prophylactics). I’m pretty sure that the knowledge I acquired from the camp over these four days helped me hold a draw against the one and only Mechanic’s own Grandmaster-in-residence Nick De Firmian. Other students demonstrated their newfound knowledge at this tournament too. Josiah Stearman saw that his opponent was threatening to move his knight to d4, and that the c4 square was weak so he maneuvered his knight (a lesson we had on day 1). He played knight from c3 to b1 so he could follow up with c3 to prevent the black knight from coming to d4. 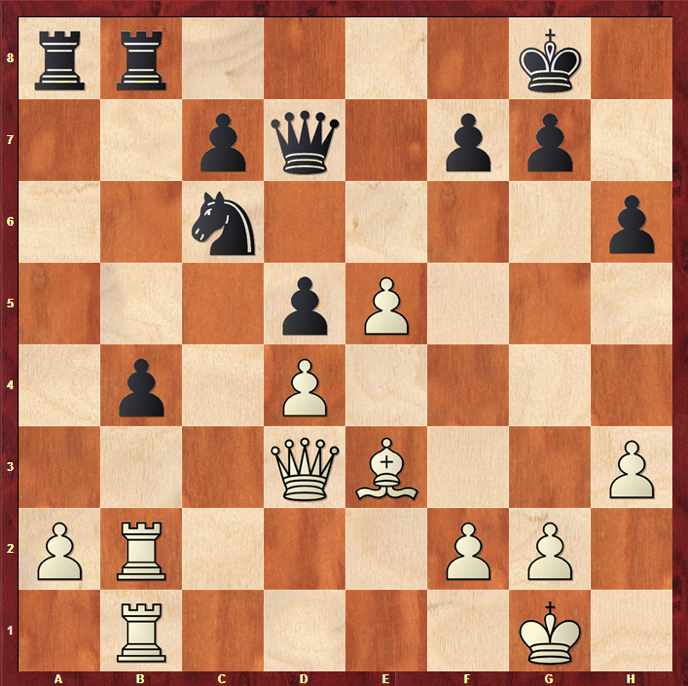 Then, he followed up with Nd2-c4 and had a nice position. Siddharth Banik used prophylactics to prevent his opponent’s only attacking idea and then followed up with an amazing rook sacrifice to have a forced win of material in four moves. And lastly, Seaver Dahlgren secured a position very similar to one of the Dolmatov games we were analyzing. Because of this, he was able to play the position well and got a winning advantage. I know that we all learned a lot from the US Chess School and I can’t wait to go again! The past week (October 7th – October 17th) was my fall break, so I had decided that I should go and play in Millionaire’s Open to a. try my luck and b. ensure that I am at least somewhat still invested in the game, as I was forced to remove myself from the almost purely academic environment I had gotten used to. I’m going to be honest here and admit that I haven’t really studied chess since the World Youth Championships last year, which is just about 2 weeks shy of a full year ago. Taking that into consideration, my performance for the last five or so tournaments I played in before Millionaire’s was a pleasant surprise. Maybe because I did not feel the stress of school, so I was able to fully concentrate on my games, or maybe I was just able to retain what I learned in Greece for only about a year, but I was able to consistently improve my rating in small increments, reaching my peak. Okay, I’ll admit that was actually my expression during my game following the three losses where I finally won a well-fought game. I think one thing I loved about playing at Millionaire was that not a single game I won was really based on ‘luck,’ I had to fight hard and play consistently solid moves in order to not be outplayed, no matter the rating of my opponent. As I’ve always considered myself to be a pretty lucky player, this tournament acted as a reminder for me that you make your own luck – study and you’ll be rewarded. Don’t study? Get ready to suffer at one point or another. I’m honestly deeply saddened that the Millionaire Chess series will most likely (I still believe in miracles) be ending as this tournament was probably one of the most consistently strong tournaments I have been to. There wasn’t a single easy game – everyone there was ready to give it their all. Now, aside from the chess and my poor performance, the tournament was a ton of fun and a great experience as I was able to meet many other players, including tournament winner Dariusz Swiercz! I’ve realized with this tournament that every tournament is a lesson – not at just the game level, but at the psychological level of our regular mental participation in the game. While I’ve been preoccupied adapting to my freshman year of college, I let chess slip out of my head, which was pretty detrimental to my play. Just by playing tournaments at a certain frequency, we are improving our play in small increments.